Grumpy’s Classics Cave: Buckets, spades - and 78s! Buckets, spades - and 78s! The other half turfed me out of the cave last month, for a seaside holiday in Brittany. It was lovely, I must admit - especially as I was lucky enough to find this set in a pretty little town inland! I was humming and hawing in the second-hand bookshop over whether to buy these - I'd already bought a few LPs and the cave's cache of cowrie shells is very low at the mo - when my French cousin casually opened a book... and found a 10-Euro note in it! Sold! So thanks to him for generously sponsoring my purchase and this post (and for having us to stay and for making that fantastic mayonnaise...). 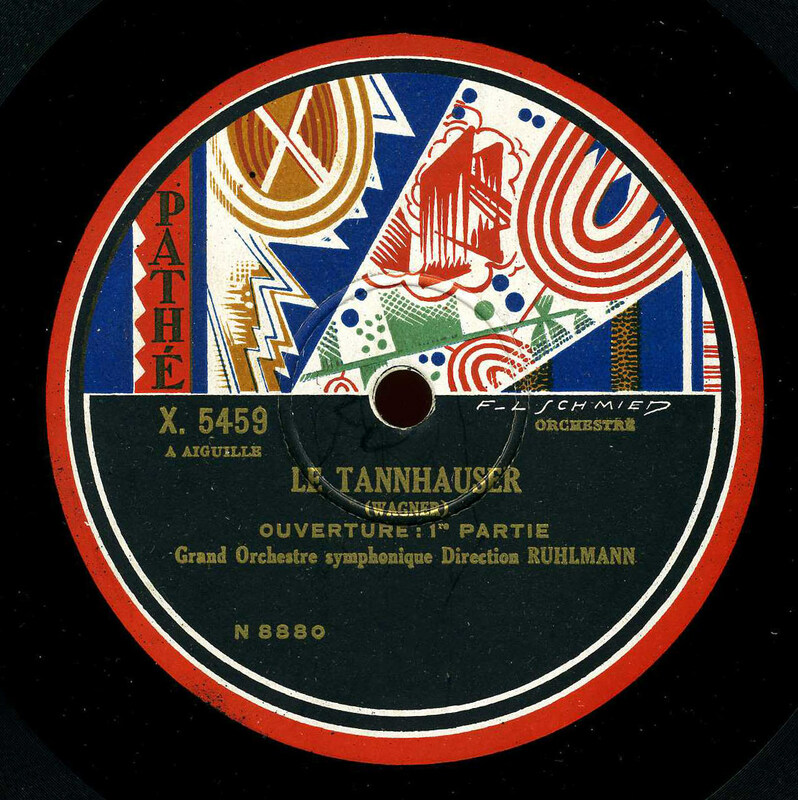 There's some interesting information on Wikipedia about François Ruhlmann (1868-1948), conductor of so many pioneering opera sets for Pathé, as well as quite a few purely orchestral records like these - Damian has already transferred and shared two: Chabrier's España and Rossini's Guillaume Tell Ouverture. Damian dated España, on X 5446, to 1931 - but I'm told that's too late; November 1928 is more like it, apparently. Sound-wise, that feels more likely to me, I must say. Download the mono, fully-tagged FLAC file here. By the way, I'm very interested in two mysterious chamber music sets that were issued by Pathé about this time, the great Classical quintets for piano and winds in E flat: Beethoven's Op.16 on X.9791-94 and Mozart's K.452 on X.9822-25. I missed a copy of the former on eBay a while ago - drat and blast! - and I omitted to save the label pic, though I do remember that it wasn't one of these 'Art' labels. Were they really 10-inch, as this listing says? Surely 29 cm, i.e. just under 12-inch. Frustratingly, both sets were issued without any artist credits. If you have any idea who played these, when they were recorded or - even better - you have copies you'd like to share, do get in touch - or post them outside your own cave? Nick - thanks to you and jolyon for posting this set. I have a couple of Ruhlmann items myself and will post a single American Columbia 78 with him on the RMCR board tonight. These Pathé-discs are amazing, but I think the label is even better than the actual record. A truly "designed" label showing the art deco style, and the designer even having his name on the label (F-L Schmied = Francois-Louis Schmied). Schmied was a Swiss illustrator and book publisher and apparantly very important in the art deco movement. I have X 5458 by the way, which is the same orchestra, same conductor, playing Jules Massenet's "Hérodiade".